The Sports Coalition, which represents most of the sports shooters in the State in the matter of firearms licensing, has lodged a formal complaint with the Garda Síochána Ombudsman Commission (GSOC) over what the Coalition says are misleading and inflammatory statistical data published by An Garda Síochána. The complaint also cites the use of deceptive photographic imagery depicting firearms that are not permitted for licensing in Ireland. The Coalition has forwarded a copy of the complaint to the Minister for Justice and Equality, Frances Fitzgerald TD. It is noted that the Minister has had to issue a further clarification on the figures today, which clearly indicates that a very significant number of firearms were in fact unlicensed and therefore did not come from licensed firearms holders. The National Association of Regional Game Councils (NARGC) is the largest organisation in Ireland involved in game hunting and conservation. It is, by any measure, the most active association in the country in the representation and defence of the interests of shooting sports enthusiasts. It has a network of 964 gun/game clubs around the country affiliated through the County Boards – one in almost every parish. Because of its broad representation and relevance for rural activities, the NARGC is a nomination body for Seanad Eireann on the Agricultural Panel. The Association can nominate two candidates to stand for election in the Seanad Elections following each General Election. In addition, most NARGC clubs are “Recognised Bodies” under the Wildlife Acts – a recognition unique to NARGC clubs. This means that the recognised clubs may take prosecutions for breaches of the Wildlife Acts. Justice and Equality in the matter of a proposed review of the firearms licensing system and is active in political lobbying in that regard. The Commissioner of An Garda Siochana has caused to be published statistical data in support of a proposal to ban certain firearms which are currently licensed to citizens and the data concerned purports to represent firearms stolen from the homes of licence holders. This data has been confirmed and re-enforced through parliamentary questions on the floor of the Dail. We have vigorously challenged the figures and we have established that they are grossly incorrect and overstated e.g. some firearms included are taken from members of the security forces (including Gardai), some are blank firing, some are de-activated, many are taken from firearms dealers premises etc. In other words, a great many which have been attributed to licence holders were in fact stolen from people and premises other than licence holders, thereby giving a distorted impression to both the general public and to members of the Oireachtas who have been charged through the Joint Oireachtas Committee on Justice to examine the proposals and make recommendations to the Minister. The Oireachtas Committee has facilitated the RTE Prime Time programme, with our co-operation, to film the Justice Committee attending a demonstration of the types of firearms which are permitted to be licensed in this jurisdiction at Harbour House Shooting Range at Nurney, Co Kildare on the 12th of February last. The Prime Time programme is due to broadcast a programme imminently featuring the debate on this issue with argument from both sides. Misleading politicians generally but particularly members of the Joint Oireachtas Committee on Justice, thereby constituting an undue interference in their duties as legislators. 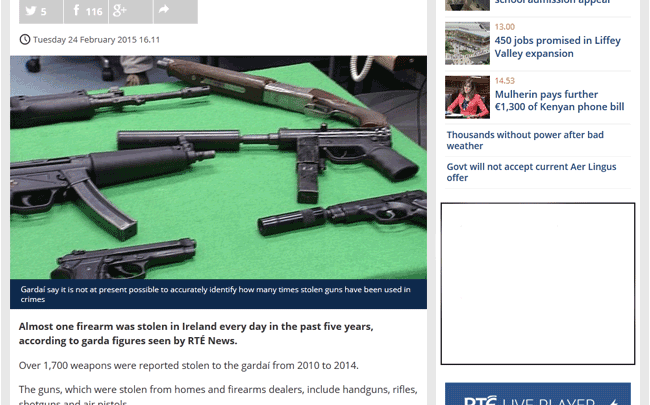 We further charge that our complaint is strengthened by the publication of a photograph accompanying the Garda press statement showing images of a number of firearms, none of which may be licenced in this jurisdiction. These included a sawn-off shotgun, a machine pistol, a machine gun, an assault rifle, a pistol fitted with a silencer etc. These images were provided for no purpose other than to mislead and falsify the legitimate activities of lawful sports shooting enthusiasts. We complain that this constitutes a misfeasance in public office by the Garda Commissioner and such other of the officers advising her and who were involved in this deception and we request GSOC to carry out a thorough investigation of both the figures published and the use of such inflammatory photographic imagery. The number of the 17 handguns listed which were licensed to firearms licence holders at the time of the alleged theft and the number stolen from the licence holders’ homes if different from the number licensed. In relation to the 40 air pistols reported to have been stolen in the same period, how many were licensed to firearms licence holders at the time of the theft and how many were stolen from the licence holders’ homes, again if different from the number licensed. In relation to the 40 air pistols reported to have been stolen in the same period, were these in fact airsoft pistols stolen from the licence holders’ homes. In relation to the 17 handguns and the 40 air pistols reported to have been stolen in this period, how many were stolen from premises other than licence holders’ homes, for example club premises, firearms dealer’s premises, or from the homes or premises of persons who were not the licence holders. How many of the 1,700 firearms which were reported stolen, were unlawfully taken from places or premises to which the provisions of S.I. 307 2009 Firearms (Secure Accommodation) Regulations 2009 expressly applied at the time of the thefts. A figure of 947 firearms are accounted for by category in the overall figure of 1,700. What were the remaining 753 and can you please provide a breakdown. How many of the 1,700 firearms which were reported stolen, were crossbows, replica firearms, blank firing firearms and de-activated firearms. How many of the 17 handguns reported stolen were replicas, humane killers, flintlocks, blank and de-activated firearms. How many of the 17 handguns reported stolen were taken from members of the security services in the Republic of Ireland and/or in this jurisdiction from members of the security services of Northern Ireland. Were any of the 17 handguns reported stolen air pistols within the meaning of the Firearms Acts and if so how many. How many of the 17 handguns reported stolen were centrefire guns and how many were rimfire. Were any of the 40 air pistols reported stolen in fact airsoft pistols within the meaning of the Firearms Acts. We have submitted these questions to the Commissioner, but based on previous experience, we do not expect to get an answer. We trust our complaint will be examined as expeditiously as possible and we remain available to meet your investigator/s as you deem appropriate to answer any queries you may have.